Last Christmas our house was invaded by so many toys, since they had been so good Santa delivered a large load, our kids have generous grandparents and lots of aunties and uncles as well and everyone knew that small noses would be turned up at practical gifts so we had a toy flood. With so many new things it’s interesting to see what favourites emerge, and I’m always nervous that the most expensive thing that was begged for will get ignored (this is from experience). The world is divided into the parents who let Playdoh into the house and those who don’t. We’re “letters in” – they love it and it keeps them occupied for ages so we put up with the inevitable mess. The dried up playdoh sweeps up easily so the only real calamity we’ve had is cord trousers being damaged from kneeling in it. Cathal got the Diggin’ Rigs crane last year, and has asked for the Buzzsaw this year. They have the vehicle and then moulds with it to make bricks by putting the playdoh in and pressing it, so we had lots of playdoh walls. Nearly a year later this toy is still played with at least once a week. It’s carried by most toy shops and they’re often on offers. The Play-Doh Diggin Rigs Boomer The Fire Truck is reduced on Amazon at the moment. Cathal had spied this months ago and had found it in three different Tesco stores and spent ages playing with it but forgot to ask Santa for it. By a complete coincidence my friend bought it for him. He adores it. He says he’ll share his other toys but that this is too special and important. He even fought a five year old (not his brother) for it! Santa has a tough job in this house with two boys comparing what they got constantly so he was lucky to find Jake and the Neverland Pirates jigsaws in sizes suitable for both a 3 year old and a 5 year old. Because they both had them if one decided to play then the other did too, so they got twice as much play as normal. Ciarán (5) spent hours and hours finding Wally and using Wally stickers. We all need some Wally in our lives! The boys got a couple of annuals, the Disney Junior and Angry Birds ones among them. There are so many games and puzzles that Ciarán spent hours of quiet time with them. They’re definitely on the list this year, keep an eye out for bargains, they’re often on 3 for 2 offers in bookshops or supermarkets. Seriously. It’s the cheap tat that they love. This kiddie head torches, bought in Munchkins Toy Shop in Gorey were worn to mass on Christmas Day, all the rage. The Euro shop ones for grown ups will also go down well. I wasn’t asked to link to or mention the other suppliers listed in this post. baby's first christmas, Christmas, five year old, gifts, play, six month old, three year old, toys. Bookmark. Good list I love the glitter crayons, how cool! I think on foot of this post they will sell out! Everyone wants them now! Got the crayons yesterday, delighted with them. Also told everyone I met to get them too! Annuals are a great idea – didn’t think of that at all until I read this post last night. My mother-in-law asked this morning what the kids would like for Christmas and we said annuals. Thanks for a great idea! Oooh! LOVE the glitter crayons. I haven’t seen those. Hubby is determined to get my girls into annuals this year as he has many fond memories of getting them when he was a child. Good to know they can still be a hit! The glitter crayons are being very well received. I hope we get some more here this year! Thanks Claire, they want the other stuff but they spend their time playing with the simple stuff alright. I’ve got one of those playdoh things on the list for my son, glad to hear they’re good. 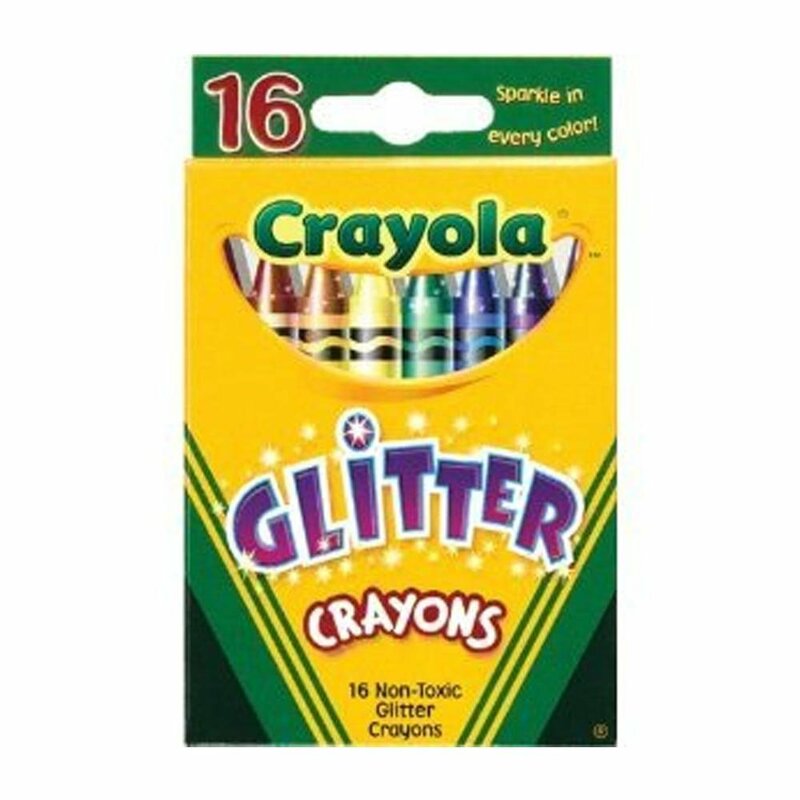 The glitter crayons might have to go into the little girl’s stocking!